Another new spinosaur! These things are popping up like daisies! This one found in Laos, no skull but a partial back complete with strange sail! Hey Brett! Good texture in the back! 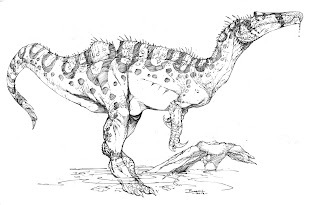 I have good news, there is a spinosaurid from Central Africa Jurassic called Ostafrikasaurus. Its very basal spinosaurid. Probably these guys envolved in Africa from an Unknow theropod. Andrea Cau over on Theropoda is saying it's most likely a Ceratosaur, not a spinosaur. I've heard talk of either a tooth or a finger bone that MIGHT be from a Jurassic spinosaur found in the US. It had 2 sail like a basilisk lizard and the Primeval spinosaurus or this is a brokened sail? And its a juvinile or an adult animal? A single sail that appears to not be broken, it looks as if it has a notch. It's possible it was some sort of abnormality, but the chances of that are remote. Not sure of the age group. Maybe it's a juvinile? Because the holotype of the baryonyx (which is 9m long) is a juvinile. This holotype only 7-8m. The most spinosaurs are very big, about 14-19m. So maybe the adults had bigger and and better sails, like the modern day Jesus or Basilisk lizards. Nothing I've read says it was a juvenile. And that estimate for spinosaurus was most likely an over estimation. I think most people say it was 15-16 now. Long, but short legged. And no the sail on the juvenile spinosaurus they have is the same as the adult. I think the spinosaurs had long legs like the modern day storks. The short leg is not logical. Mostly likely the ones like suchomimus were waders and the ones like spinosaurus were more swimmers. It's strange but it's true. Love everything about this drawing. Thanks! I do appreciate it! If that's a problem, I'll delete it right away. Also, I want to ask you if can I have the permission to post it on DeviantArt too. Since your problems with that site and the fact that the drawing is yours, to inform you was the right thing to do.